What’s a lively conversation, and a rich cup of coffee without the perfect ambiance? Nothing worthwhile for the time of a busy designer! 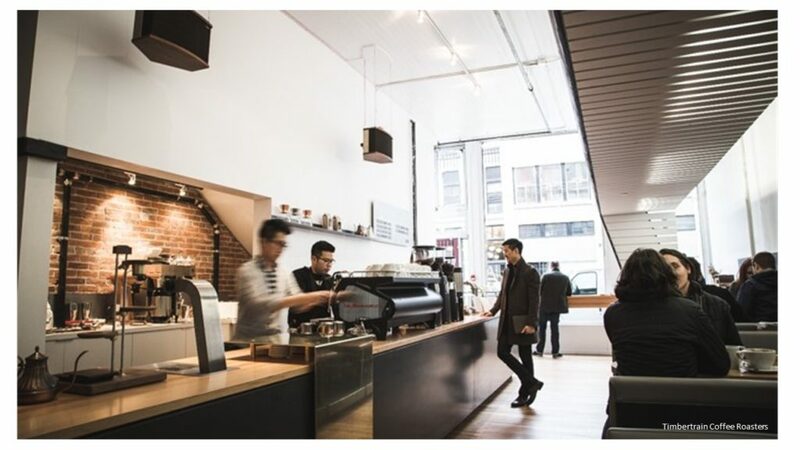 Rain or shine, Vancouver has no shortage of hip and charming coffee shops for that caffeine fix with friends. 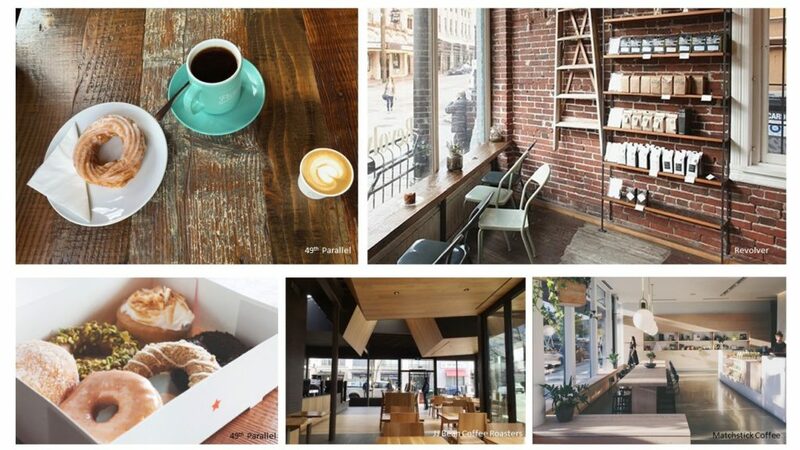 Here we round up a few of our favorite places to grab a cup of joe! Practically the wizards of coffee. Everything is measured to precision and served by the definition of fresh. Specialty pour over coffee goes well with the snug seating that lines the walls for some serious one on one convo. The aesthetic matches the central Gastown location; Warm woods, industrial lighting, and brick walls. All in all making it an essential coffee time favorite. What’s better than getting your morning started with coffee? Not much! However, feeling relaxed while doing it measures pretty close. The brand is home to a few locations, but each one never fails to pair gorgeous blonde woods with in house roasted coffee. The minimal aesthetic goes well with a light and genuine conversation. Every coffee is just as simple and honest of each of their café’s. It is a tested fact that JJ Bean makes one of the best chai lattes and chocolate zucchini muffins around town. Not only appetizing but, each location has an amazing layout and unique feature. The dynamic skylight at Cambie and 18th, the herringbone stone wall at the Dunsmuir location, and the large decorative cedar columns throughout the Lonsdale location are just a few of the fun design elements. This coffee shop deserves all the hype surrounding it! Lucky’s doughnuts and their in house coffee roasting is done to a whole new level of professional quality. There is something very charming about their vintage light blue branding, and industrial decor. There various locations always offer a friendly vibe. We especially love the large fresh patio space on w.4th that can be enjoyed year round. Another great example of a slow bar café, this location starts from the bottom up with one of a kind coffee, espresso, and more. They pick their beans, they roast in house, and they do their pour overs right there for you to watch. Their passion for coffee rivals that of their design aesthetic. Surrounded by red brick walls, and warm hardwoods, it’s as if you were sitting in a train station on a quiet night, seeking true comfort and a delicious coffee. Remember that floral printed sofa from your childhood? Just the memory of it makes me cringe. If you have been avoiding floral prints like the plague, this might be the season you give it a chance. Lately we have seen a lot of geometric prints such as hexagons, chevron… you name it. We think it is time to try something different for a change! Gone are the days when florals reminded you of the Victorian Era. Taking an entirely new direction, they have moved away from the traditional look and feel – projecting a cool and modern vibe that can be incorporated into schemes that are urban and contemporary. There are no rules as to how you can add floral patterns into your space, although we would advise you to do so sparingly. Keep reading to find out how we would incorporate florals into a space! Why not try something daring and layer bold florals over bold geometric patterns? You can give this look a try in almost any room! From wallpaper and fabrics to décor and stationary, you can give this bold look a chance in a small or big way. Finnish design house Marimekko offer a range of floral prints like you have never seen before. Large scale, somewhat abstract and combined with eye catching colors, Marimekko is not for the faint of heart. If you love Scandinavian design (like we do), these prints are sure to add that extra jolt of iconic Scandinavian flare to your space. Pair them with a black and white grid or abstract geometric pattern and you can’t go wrong! This is also a great line for that tween or teen room makeover. 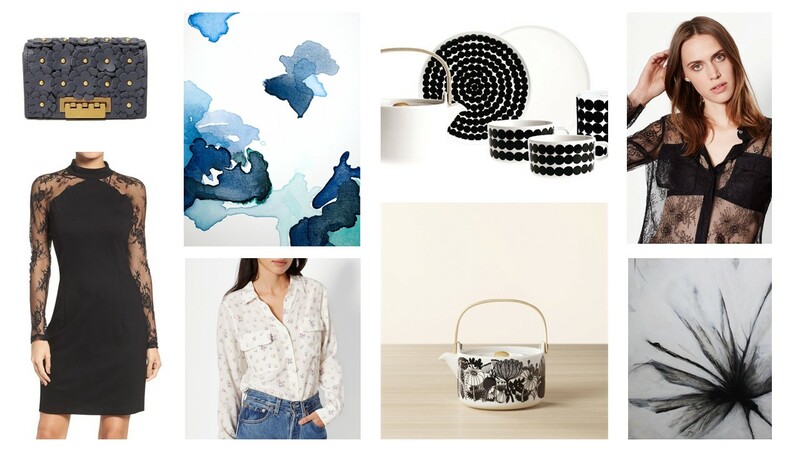 Head over to EQ3 who carry a large quantity of this product line and check out some of their home décor pieces. We love the teapot! Paintings of flowers have taken a huge turn from the literal depictions we have seen absolutely everywhere… what a relief! Although they can be hard to find, with a little searching on the internet, we have unearthed a couple artists that have put a modern spin on these. Their interpretations of florals are simply beautiful. We have recently used this artist – Vivian Caits in a model home at Zetter Place. Her artwork has a watercolor effect that creates a soft abstract floral-like design. Looking for a piece with neutral tones? Lori Popadiuk, a local Vancouver artist is one to check out. She has mixed media pieces in her wide open collection. Her free movement and subtle brush strokes just hint at the silhouette of a flower. Spring or fall we are still seeing a strong floral influence in fashion. By any chance did you purchase a floral lace number over the holidays? Perhaps like this one at Nordstrom by BB Dakota? We appreciate the subtlety of lace embroidery, flocking and laser cut outs for our floral fashion fix. The new delicate direction is one we might even embrace here at Area3. This floral pouch by ZAC Zac Posen from Shopbop is sure to add some fun to you wardrobe. Looking for something more romantic? Consider this silk button-up shirt from Equipment or how about this revealing lace number. Sure to be a contender for that date night. For the faint of heart, try adding a simple accessory like this scarf from Indigo (also easy on your wallet). Keep it simple with just a hint of floral in your wardrobe or your home decor taking cues from the latest in fashion!